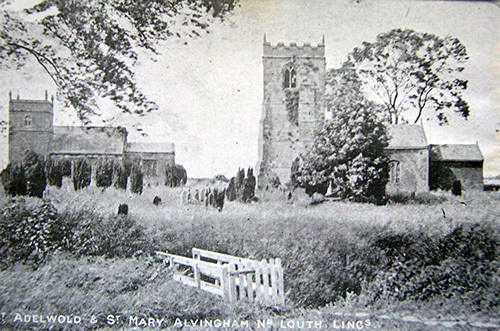 Notably, Alvingham has two churches in the same churchyard, one dedicated to St. Mary, the other the only church in England to be dedicated to St. Adelwold. Although Alvingham is not unique to England in having two churches in one churchyard it is quite unusual. St Adelwold's, the parish church of Alvingham has the large stately tower. Though the present church of St. Adelwolds dates back to 1131 (Davies, 2001) it was built on the foundations of an earlier Saxon Church with the same dedication (Esling, 1972). 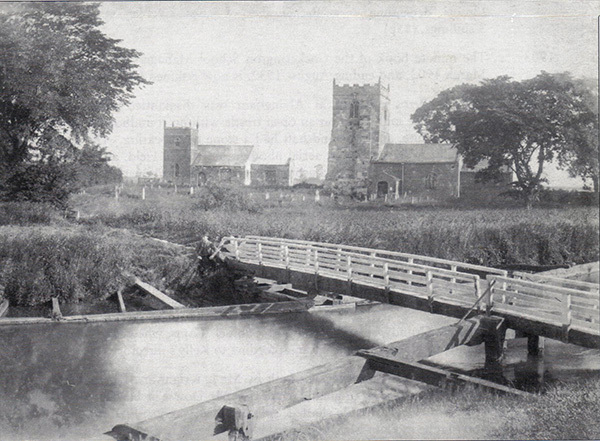 St Mary's with its stubby tower (in the background) was the parish church of North Cockerington. St. Mary's Church is believed to have been founded in the first half of the 12th century. The actual date is not known for certain. There remains in the chancel north wall, a small Saxon window with a little moulding in the head stone (Davies, 2001). It is now in the care of the Churches Conservation Trust, further information can be seen below. Davies J. P (2001) Alvingham and North Cockerington F.W.Cupit (Printers) Ltd.
Esling, M (1972) The Parish Churches of North Cockerington and Alvingham Allison and Wilcox. The church is no longer use for regular services and is in the care of the Churches Conservation Trust (CCT). About a year ago, the decision was made to keep the church open permanently. Perhaps surprisingly, this has the effect of reducing vandalism. The image shown below extracted from (Davies, 2001) is thought to have been taken in the late 1800s. One of CCT's main aims is to build up visits to rural churches. Over the past 18 months, CCT has developed a programme placing small art works in churches. A number of churches in and around East Lindsey (14 in all) were selected for this (the "ArChWay" project), including St Mary's. The artwork in St Mary is a small stained glass installation by the artist Derek Hunt which is fixed to the original windows in the north aisle of the church. It incorporates a poem by the Lincolnshire Poet Laureate Joel Stickley which describes St Mary (in rather poetical terms) and there are references (post codes) to the other churches that form part of the Archway project. It is well worth looking at. The whole project is described in a handsome "concertina" (fold out) publication bound in wooden boards setting out an arts trail between the 14 churches. This is located under the artwork. At risk of stating the obvious, it needs to remain in the church permanently. There are also a number of smaller card cover "concertinas" which are free for people to take away as more can be obtained. The artwork and the art trail book are well worth a visit to see and if you do so, please sign the visitors book as CCT funding depends to some extent on visitor numbers.